This is a rare species which flies only uncommonly in parts of the Pyrenees and Cantabrian Mountains. The well developed ocelli are generally devoid of any marked surrounding red areas on the hindwing and the pictured specimen has very little red on the forewing either. This gives an overall rather smart appearance. 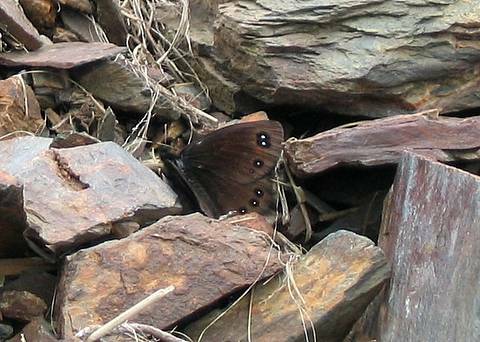 The butterfly is to be found flying over south facing, steep, shaly screes which are awfully difficult to negotiate for photographs! Indeed the butterflies seemed uninterested in venturing off this restricted habitat so the best method for getting a picture would probably be to sit close to an odd nectar source within the scree and wait for a visit with fingers firmly crossed.